In my mind, I could literally see the baguettes losing their glow, sense the freshly harvested radishes withering away in the stale air, and the butter turning to gloop. No effing way, I thought! This farm boy is not going to sit on a bus for three hours on such a beautiful day, so I got out then and there, and hit the road on foot. 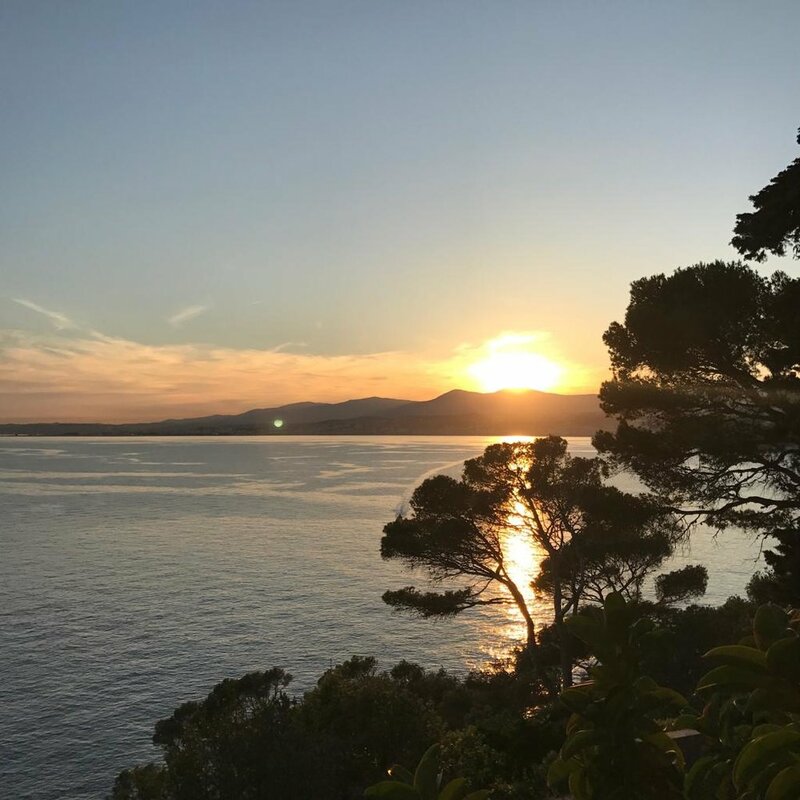 An hour later, I had explored a side of Eze to the east of Nice I had never really discovered, and my pilgrimage had taken me not to the mountains, but to Saint Jean Cap Ferrat, a beautiful spot on the rocks overlooking the sea. I couldn’t think of anything better than the salt-spray air and gentle spring sunshine to go with the radishes and baguettes that had been my loyal companions for the last couple of hours. 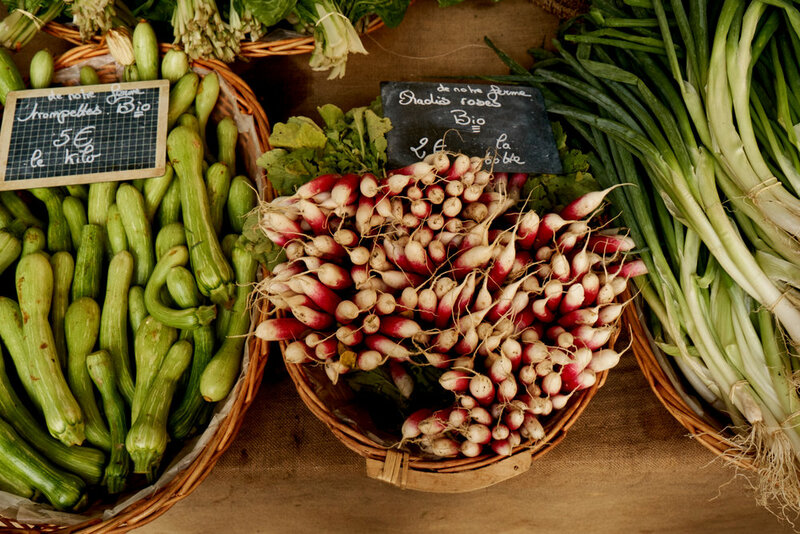 Radishes have just come into season in France, the sight of which has almost become the official announcement of picnic season and spring. It’s also when the stems, or tops as we call them, start to become a regular feature in soups all across France. Look out for the recipe in the coming weeks. Like an onion, a radish gets very defensive. As soon as you pierce its delicate skin, whether cutting or grating it, it releases a vapour that makes your eyes tear up like those of a bad soap actress, and triggers an itch in your nose. But this self-defensive quality is precisely what wakes up your palate, and also what makes you taste whatever you eat with it so much better, whether it’s butter, smoked ham, roast beef or cheese. Grate half a cucumber and add 250 ml Greek style yogurt. Add 1 clove of garlic, finely chopped, and season with salt and freshly ground black pepper. Chop up 4 mint leaves and add them to the tzatziki before decorating it with fresh mint leaves. Slice 10 medium-sized, fresh radishes. 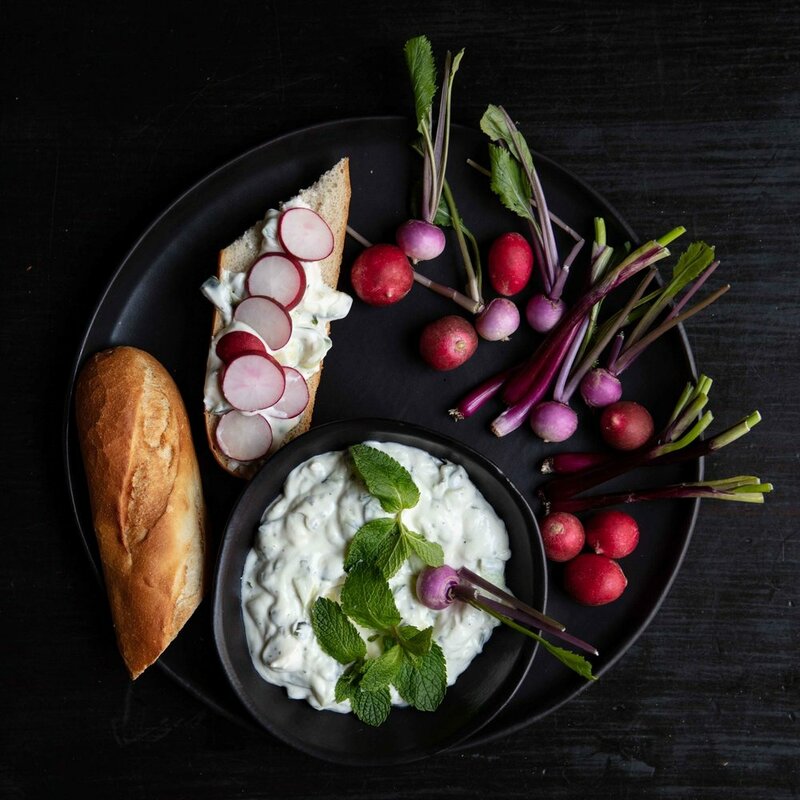 Spoon some tzatziki onto a piece of French bread and top with the sliced radishes. Serve with some more baby radishes and spring onions.